Don’t get me wrong, I’m no scrooge, but I don’t get into the Christmas spirit because of gifts. Let’s be honest: there are very few people on this planet that actually enjoy being stuck in a mall, rushing around for gifts that mean very little, but cost quite a lot. That is not what the holidays are about. Most people love the holidays because they tend to bring people together. Families playing football in the back yard after a turkey feast; grandparents watching Christmas Vacation with their grandchildren; decorating the Christmas tree and remembering just how each ornament came about. These are the things that make the holidays special. Despite this knowledge being fairly widespread, my family has a really hard time with the thought of having a giftless Christmas. This is a yearly source of frustration for me. Every year, I express my desire to have a quiet family gathering rather than a big gift giving ordeal. Every year, my family agrees, and then forgets about the agreement as soon as they hit the malls. Everybody loves food, especially food that they don’t have to cook. Instead of just making candied nuts and putting them in mason jars (what is with the food in mason jars obsession? ), set something up with your family where you make dishes that you know they love, and new ones that you think they’ll enjoy. Giving your family members gifts of food helps them save time (they won’t have to cook for a few nights) and can be very personal, as each person has different tastes and preferences. 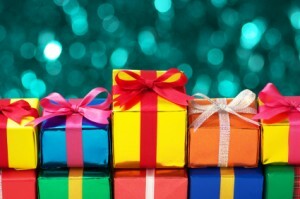 Giving the gift of an experience is still gift giving, but it’s much more enriching for both the giver and receiver. Propose to your family that you give one another experiences for the holidays – ie movie or concert tickets, dinner gift cards, wine tours, or tickets to events. If you give everyone tickets for the same events, it’s even better, because then you’ll be able to spend time together at the event, too. If you actually sit down and total up all of the costs associated with Christmas, including the gifts, the extra gas, the alcohol and food, and the cost of hosting guests, you’ll find that you probably could have gone on a vacation with the sum. Agreeing with your family to go on a vacation (even a short weekend vacation) instead of giving gifts and having a formal get together at home is a great use of your time and money. You’re still spending the holidays with your family, but you don’t have to stress about what to buy one another. Not all families are willing to move themselves away from the tradition of giving items as gifts for Christmas, and that’s okay. Despite Christmas shopping being a stressor, it’s also deeply ingrained in our culture, and can bring some people a lot of joy. If this is the case for your family, setting a one-gift rule can save money and time. Agreeing to all get one another only one gift – or to just do stockings – can also channel a lot of creativity and thought into that one gift. Have you ever proposed an alternative to traditional gift giving for the holidays to your family? While we have our son around, I think the Christmas gift giving will continue, but I wouldn’t mind doing something along the lines of giving back to the community instead once he’s moved out onto his own. Yes, definitely when there are kids around gift giving can be much more fun! Giving an experience seems like a good idea, like buying them tickets to an event, concerts or even as simple as a movie, especially if we can enjoy it with them. Exactly! Giving the gift of time spent together is something I think is valuable. Stockings definitely can force you to get creative. Our stockings are now toiletries and things we need (batteries, etc). It gets pointless because we always get each other the same things, haha. Having a more traditional Christmas is wonderful if you can get all of your family together. I hate to say it, but when you come from dreary old UK, snow in Canada on Christmas just gives you that extra punch of the holiday spirit. It’s the small things that make it a special day. Some great alternative ideas for gift giving though, loved it. I have asked my sons, both struggling university students, to do some repairs around the house instead of gifts for me this year. I let them know in September that I am just as broke as they are this year and that presents would be very minimal. They understand and are supportive but I know it would be very hard if they were younger and still believed in Santa. I shop all year round for practical gifts when they go on sale and I am done for the year except for a few food treats to put in the stockings. That’s a great idea. I try to shop all year too but then I drop the ball after the first couple of months in the year. Hahaha sounds like you’ll always be in the dog house unless you start back up! Great post. I’m a part of a family that doesn’t want to move from tangible gifts and that’s OK with me. We did implement a one gift rule among siblings, mostly the advantage of my youngest brother who would normally buy four gifts one for each of his siblings (and their spouses) and now he just has to buy one gift for one of us. As a young 20 something in grad school that’s a big deal. We also decided on a spending limit, even though my sister and I often go over it it’s freeing for my brother to know how much he’ll need to set aside for Christmas. Limits on gifts can be just as effective for saving money – it does take the edge of pressure off the people who cant’ afford it! Quite a few years ago, we agreed that all adults would no longer give Christmas gifts to other adults in the extended family. We still give gifts to nieces and nephews, although now that some are adults, we aren’t sure what to give. The last few years, we’ve given the adult “kids” money. They were happy with that. I like the idea of taking a vacation with extended family. In fact, we offered to take my mom on a vacation anywhere in the US next year. She chose a 4-day visit to Lake Tahoe. So we made reservations for a two-bedroom condo that that has it’s own dock on the lake. That pretty much blows any Christmas budget, but it should be lots of fun. Much better than mall gifts. Great gift idea – I’d rather spend a lot on a trip like you have mentioned than a little on material items. There’s nothing like spending time on family! My mom loves giving her grandkids theme park passes most Christmases. Saves a lot of clutter and gives her something to do with them when they visit her. There are a few in her area, so she just switches the passes around each year. My sisters and I do name drawing for gift giving for each other and the kids. This way each person gets one better gift instead of several smaller ones, and no one has to do a ton of shopping. What a great gift idea! We don’t have any theme parks around here but love the thought. Haha I guess if you aren’t crafty, it’s jus easier to buy something! I’m right in the middle of my Christmas shopping. I do most of mine online so I can do it whenever I have some down time which is nice. Fortunately I don’t have a huge family so it’s not that stressful as long as I start early enough and can avoid rushed shipping costs. That’s great. I love doing online shopping but being in Canada, shipping makes it not worth it sometimes! Costs me a little petrol to drive into the country for some pine, and a little bit for some wire. That’s really cool! I love wreaths and homemade is so special. We always buy for the kids, too.